When I was buying sets to review, I had wanted to purchase 70501 Warrior Bike, but unfortunately wasn’t able to get it, so I settled instead for 70502 Cole’s Earth Driller, which is similarly sized. Although I still want to get the Warrior Bike eventually, I’m happy I got Cole’s Earth Driller, because it turned out to have more interesting pieces than I’d thought. It has 171 pieces, and retails for USD $19.99. 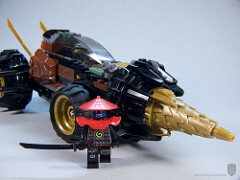 The set consists of a lone bad guy, and the eponymous earth driller, driven by Cole, who always gets the black vehicles in the Ninjago color-coded universe. Inside the box are three bags (not numbered), the instruction book, and a sheet of stickers. Now, those who have read my previous reviews know I’m not a fan of stickers. But I applied all save one (the canopy sticker) of the stickers that came in this set. They were simply too cool and too useful for me not to apply (though I’d still rather have printing). The best of the lot was easily the big sand green sticker which goes just under the front of the cockpit. I’m not sure exactly how the designs on it and on the black stickers go with the aesthetic of the Ninjago world, but they look purpose-made for Steampunk builders. Bravo, I say. The earth driller is a good sized vehicle for a set of this price, being around 30 studs long, and of course has a huge drill on the front. 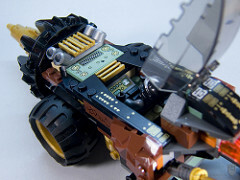 It’s the same mechanism as was introduced in the Power Miners sets, with the larger black part spinning in counter-rotation to the pearl gold drill when the vehicle is driven forward. The whole car is built on a Technic frame, which makes it tremendously sturdy. Both the drill and the 4×4 circular plates in the rear wheels are new in pearl gold, and I’m always happy to get new pieces in that color. 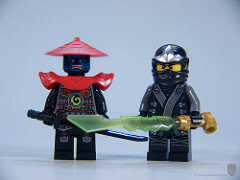 The minifigs included are standard fair for this wave of Ninjago, but cool nonetheless. Cole is simply a black version of the red warrior Kai in the Fire Mech set (read my review here), though there are some subtle differences in the printing between the two, such as different logos and buckles. Likewise, the bad guy is very similar to the one in Kai’s Fire Mech, except that I guess this one is higher ranked, since he’s taller and sports pauldrons. He also has a different, cool blue mask for a face. The pauldrons are a new piece to this line, along with the ninjas’ super swords. Cole’s sword here is identical in shape to Kai’s yellow one, but Cole’s is trans-bright green with a trans-black infusion. Here are links to the inventory pages. This seems a very solid set for the price, though I do wish it had at least one more play-feature, like rear suspension or a pop-up missile or something. It’s a very chunky, heavy vehicle with a huge drill on the front, which I suppose is precisely what you’d want on a real earth driller, but it leaves me wishing for something more. The minifigs are great, and I’ll definitely be getting more of the stickered pieces. 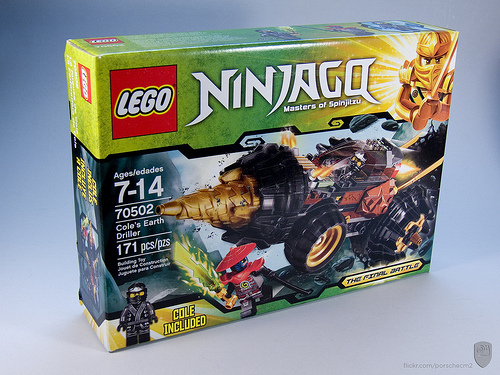 I have never got NINJAGO before but this looks good. Any other sets you would recommend? Did you catch my review of Kai’s Fire Mech earlier in the week? It’s an awesome set, and I highly recommend it. I also absolutely love the 9448 Samurai Mech. 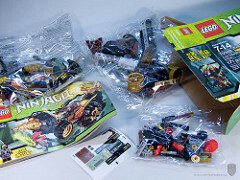 I think it’s the single best Ninjago set yet.